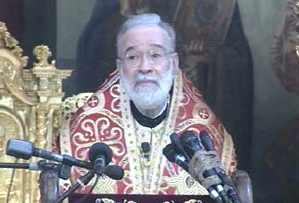 Greek Orthodox Archbishop of Beirut Elias Audeh stressed on Tuesday that Lebanon will not regain its reputation except with the efforts undertaken by its honorable citizens. “The people are equal before God even if their culture or social levels are different,” Audeh said during New Year’s mass. He called on the state to protect the citizens and treat them equally and with justice. “As long as we belong to one nation we share the same fate,” Audeh pointed out. He urged the government to kick off the appointment of top civil servants in state posts according to efficiency without referring to their religion or political affiliations. “The Orthodox were the first to demand the state to appoint the right person in the right post,” Audeh noted. Audeh hoped that the Lebanese would kick off constructive work this year to safeguard the country.